The IBM super-computer Watson that obliterated its human competition on the trivia show Jeopardy last night has one more chance to humiliate the species tonight. Game designer Frank Lantz, however, believes we can strike back at Jeopardy-winning machines. "It's all about the buzzer," Lantz wrote on Twitter. "Watson has some kind of built in buzz delay, improve your buzz speed to beat him every time and play a straight control/denial game. This would be a form of soft collusion but so what, that's what humans are good at, that's what Watson IS afterall." I like Lantz and I like the games that his company — Area/Code, now a part of FarmVille studio Zynga — makes. Area/Code's Drop7 is my most-played iPhone game. So I'm into this. 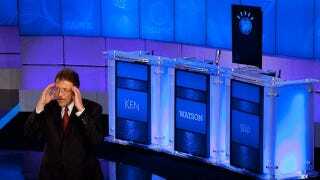 IBM programs its Watson computer to win at Jeopardy. The Jeopardy people pit Watson against two of Jeopardy's contestants. Watson beats them (as it did last night, despite whiffing the Final Jeopardy round), and then a game designer swoops in with a solution that is essentially a breaking of the Jeopardy system, albeit not a breaking of the Jeopardy rules. I followed up with Lantz to make sure I got this right... The idea is that one of the two human players would get the right answer before Watson got its crack at answering? Yes, he said. The humans focus on buzzing ASAP, their concern about whether they know the answer would be secondary. This wouldn't be easy, because Jeopardy penalizes players who buzz in early. It's also not clear just how fast Watson buzzes in. Its programmers say it needs up to three seconds to figure out an answer, but it can clearly be faster, as it was beating its rival contestants in last night's episode. What I love about Lantz's idea is that it takes advantage of the computer's inability to know it is being ganged up on. Watson might know Jeopardy trivia, but it would have no clue that the battle was no longer machine vs. man, but machine vs. men. The third round of Jeopardy's Watson showdown airs tonight. Good luck, humanity!